It has been observed that in the last few months, mobile service providers in India have been lowering their 3G rates to get Indian craving for 3G speeds and getting used to it forever. 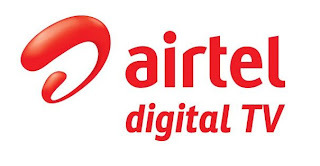 The very first company was Bharti Airtel who began the price war by lowering its 3G rates by 70% . Reliance was the next one to follow by lowering up to 90%, later it was Vodafone, Idea Cellular and Aircel. 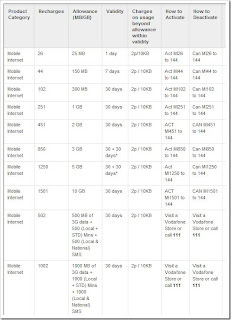 Please note that I have mentioned below the comparison based on prepaid 3G rates of Airtel, Vodafone, Idea, Reliance and Aircel for the Mumbai circle. Airtel has come up with variety of flexible 3G plans including a tariff termed as the ‘Sachet’ plan type which is offering 30 mins of 3G accessibility for just Rs. 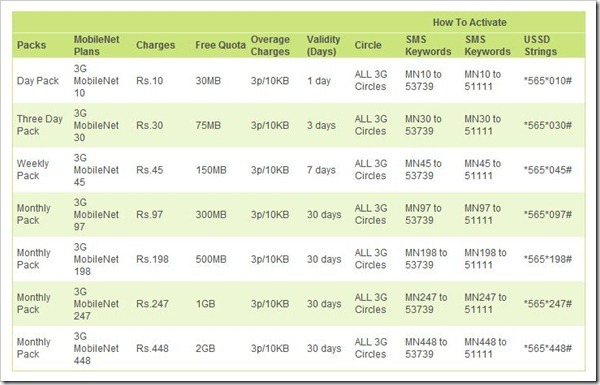 13, one more exciting budget prepaid tariff option is Rs. 41 for 150 MB which is valid for 7 days. 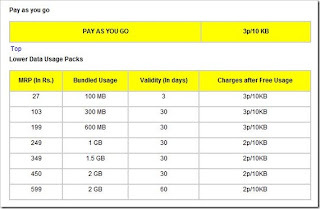 The Standard prepaid 3G plans offer varies from Rs. 101 for 300 MB to Rs. 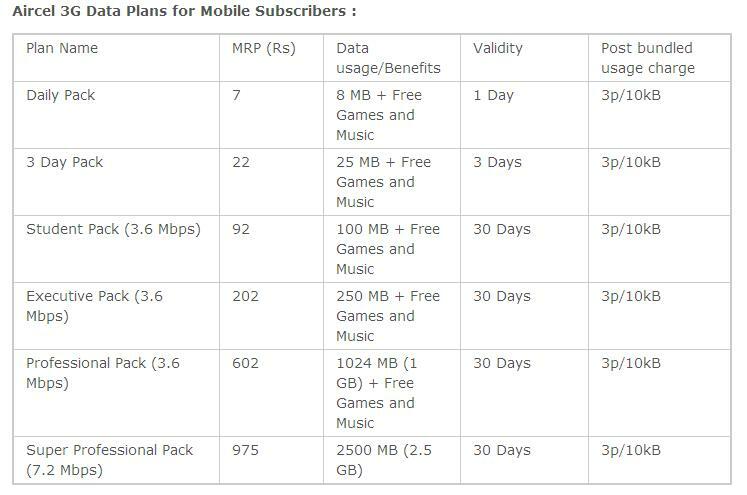 750 for 4 GB and lastly the high Value plans will offer you 10 GB for Rs. 1,500. Most of the plans have a validity period of 30 days, but one drawback is that it carries 3p per 10 KB charge on excess usage instead of 2p. 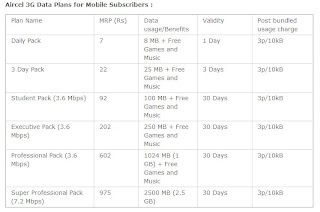 Very much similar to Airtel’s Sachet plan, Reliance 3G tariffs plans also offers you a low value day pack of Rs. 10 for Rs. 30 MB, valid for 24 hours. The plans starts from Rs. 97 for 300 MB to Rs. 448 for 2 GB, but the problem is that Reliance’s 3G plans which is having validity of 30 days are priced high but it lacks the high value options beyond 2 GB. Just like Airtel when your MB gets over then the excess usage is charged at 3p per 10 KB. 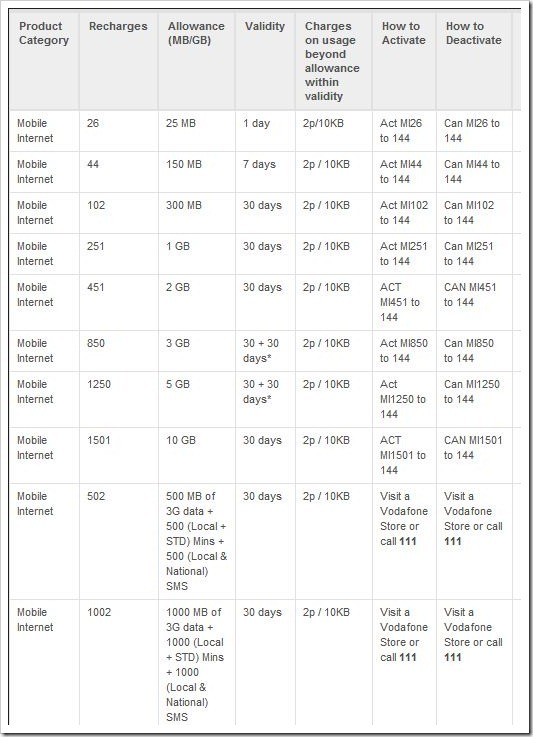 Vodafone’s prepaid 3G plans seem to be a good options, as it is priced very competitively and. I am saying this because just with a tiny recharge of Rs. 26 you will get 25 MB valid for 24 hours, and for users who think about budget then you can get 30 day validity plans which begin with Rs. 102 for 300 MB and go up to Rs. 1,250 for 5 GB and Rs. 1,501 for 10 GB. 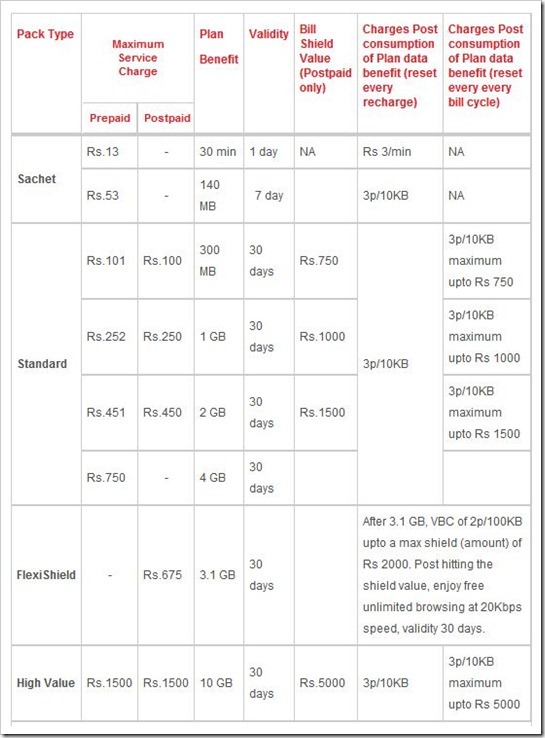 In addition to all this, Vodafone is also offering its customers the option of recharging for Rs. 502 and Rs. 1002 which will give you additional 500/1000 local and STD minutes along with 500/1000 free local and national SMS, simply unbelievable. 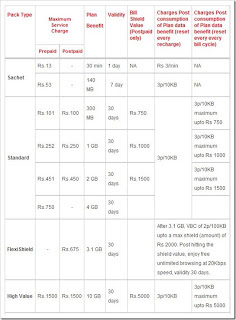 In Vodafone, almost all the plans will charge Rs. 2p per 10 KB once usage limit has been exceeded. If you are not frequent users, then this service is not for you. 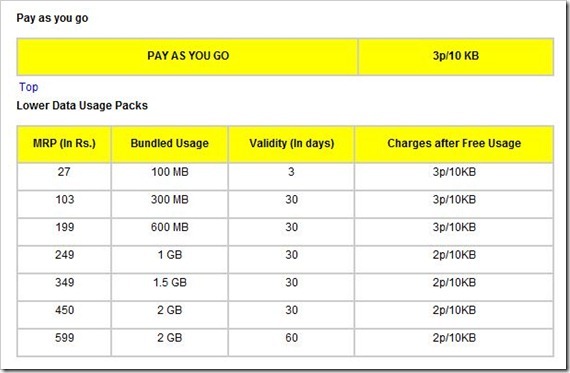 As Idea Cellular’s Prepaid Usage based 3G plans start from Rs. 103 for 300 MB and go up to Rs. 2,500 for 10 GB, so no small recharge. Most of the 3G plans come with a validity period varying from 30, 60 to 90 days and once your usage is over and gets above the allotted data limit, then it will charge you at 2ps per 10 KB which is approximately Rs. 2 per MB. 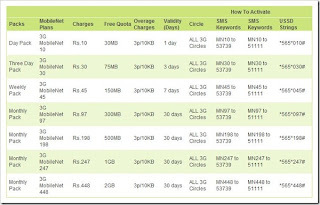 The very famous 3G plan of Idea’s 3G tariff plan is the Rs. 950 recharge which is valid for 30 days, it offers you 3G access up to 6 GB following which is actually unlimited usage restricted to 128 kbps. I have kept this service last, as many of you will not prefer to go for this one, if you want to use 3G data on your mobile. If you look at the offers by the aircel for the mobile subscribers, you will find that it is not very good as they have higher cost price and lower data. But for 3G data plan for the usb data card have brought a relief to all the aircel users as it offers unlimited plan at Rs.1250/- for one month at a speed 3.6mbps, which I think no other service company will offer you. But still Aircel is not preferable as customers of Aircel face a serious connectivity issues recently and the worst thing is that its service team has been criticized a lot. Also its high cost makes it a worse option than others.